I am in a blissful buttery lobster coma and I don't ever want to come out. Ever since our friends told Thomas and me about the epic lobster rolls they had while traveling in Maine, we've been dying to get our hands on one. We've drooled over countless articles like 14 Must-Try Lobster Rolls across the U.S., and watched video after video like How-to Make Lobster Rolls with Matty Matheson. Last weekend we decided enough is enough and spent all of our savings on lobster...just kidding; But those suckers are expensive! Thankfully our local Fred Meyer was having an awesome sale on lobster tails! I was toying with buying a whole live Maine lobster just to taste the difference and to have the frightening experience of cooking it. If you don't know this by now, I have zero willpower when it comes to good food - So a live lobster ended up coming home with me from Newman's Fish Company. I wonder if people thought I was a crazy lady walking down the street holding a brown paper bag far away from by body?! There's a big debate on what makes a lobster roll "the best". Some say with mayo, some say without; Celery or no celery; butter or no butter; Or the folks that say that the meat should be served unadulterated. We went with the light mayo route, with just a squeeze of lemon juice, a pinch of salt and pepper, and a small dose of green onion tops sprinkled on top. I know this would be blasphemy to many, but we also added a little bit of coleslaw at the bottom of our buns to give it a touch of crunch. Last but not least we drizzled brown butter on top. I mean how could you not add butter people?! To go alongside I made Bon Appetite's Crispiest Potato Chips and added a sprinkle of Old Bay Seasoning. Amazing. Mind-blowingly good, best weekend meal ever, incredibly easy albeit slightly messy. Check check check. With the 4th of July coming up these rolls would be a SHOW-STOPPAAA. We don't have a massive pot, so we cooked the lobster in our cast iron dutch oven and it worked just fine. Once I stopped feeling sad for Mr. Lobster, Thomas plopped him down into the boiling water. I know it's ridiculous, but all I think of is when Sebastian is about to be thrown in the hot water by Chef Louis in Little Mermaid. - Lobster tails or live lobsters. Depending on how many rolls you are preparing, we bought a 1½ pound live lobster and 4 small lobster tails and that made 2 HUGE lobster rolls. A good rule of thumb, 1 8 oz lobster tail per person. 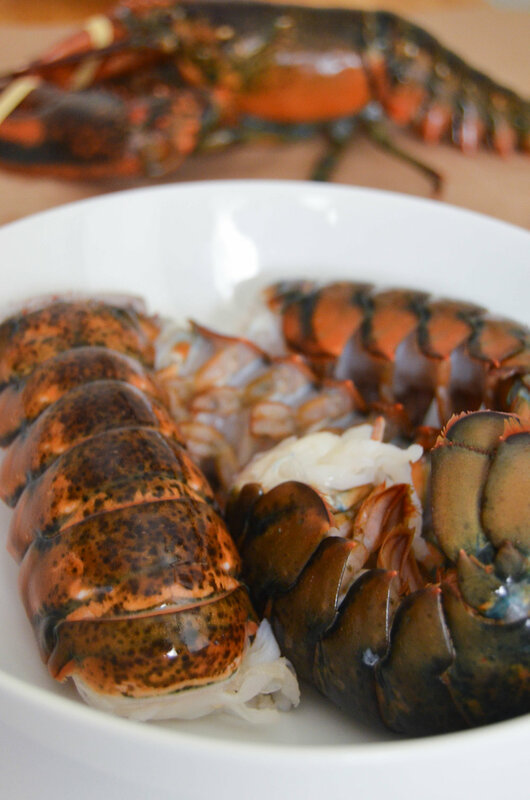 If you're buying live lobsters, it should be at least 1½- 2 pounds per person. 1) I would make the potato chips first! Slice potatoes about ⅛” thick (a mandoline helps). Place in a large bowl, add cold water to cover, and stir to release starch; drain. Repeat until water runs clear. Return potatoes to bowl; cover with ½ cup distilled white vinegar and 6 cups water. Let sit at least 30 minutes or up to 2 hours. Drain; pat dry. 2) Fit a medium heavy pot with thermometer; pour in oil to measure 4”. Heat over medium-high until thermometer registers 300°. 3) Working in 6 batches and returning oil to 300° between batches, fry potatoes, turning occasionally to cook evenly, until golden brown and crisp (oil will have quit bubbling), about 5 minutes per batch. Using a spider or slotted spoon, transfer to a paper towel–lined wire rack. Season with salt or Old Bay Seasoning! DO AHEAD: Potatoes can be fried 6 hours ahead. Keep at room temperature. Next: Make the lobster rolls! 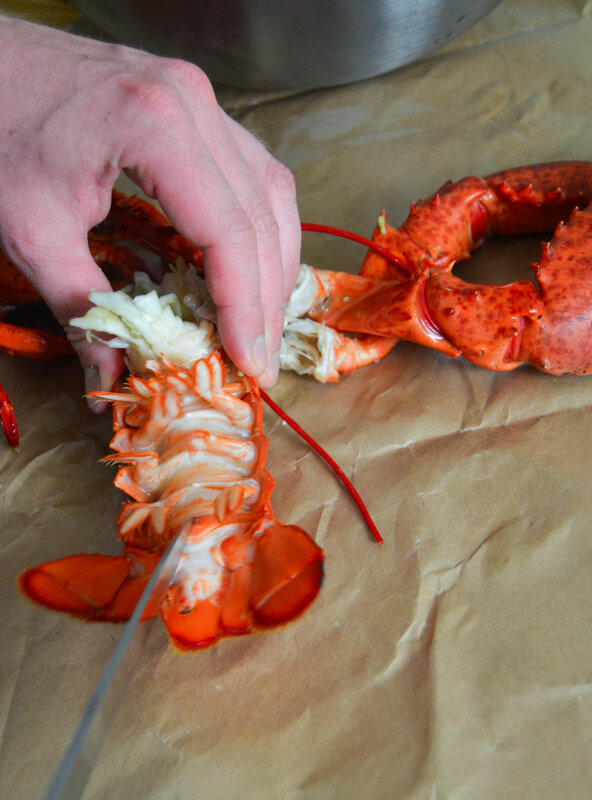 2) Crack lobster shells, pick meat from tail and claws, and cut into 1/2-inch pieces. Mix lobster, lemon juice and 2 tablespoons mayonnaise in a medium bowl; season with salt and pepper and add more mayonnaise, if desired. 3) To make the brown butter, simply start melting the butter over medium heat. Swirl the pan occasionally to be sure the butter is cooking evenly. As the butter melts, it will begin to foam. The color will progress from a light yellow color to golden-tan to, finally, a toasty-brown. Once you smell that nutty aroma, take the pan off the heat and transfer the browned butter into a heat-proof bowl to cool. When you transfer the brown butter to a new container, try to leave as much of this sediment in the pan as possible. You can also strain the butter through a fine meshed strainer or cheese cloth to remove all the particles. 4) We wanted the outside of our buns crispy and the inside soft. Brush the outside of the buns with a little of the brown butter. In a large skillet over medium heat, toast the buns on the outsides. 5) To assemble the rolls, place a layer of cole slaw and pile the lobster on high! Drizzle with the brown butter and sprinkle with green onions or chives!